While Pennsylvania’s traditional fine art scene in alive and well, the areas of experimental, digital, and other alternative art forms here are growing. Aspiring digital artists and spectators alike may explore digital and experimental art works at major Pennsylvania art museums such as the Carnegie Museum of Art, Woodmere Art Museum, Philadelphia Museum of Art, and the Pennsylvania Academy of Fine Arts. In addition, hundreds of art galleries, design studios, and art centers encourage the submission of digital and experimental art, and these art forms are often highly promoted. This is not surprising. Pennsylvania is the nation’s sixth largest state and it is home to some of the country’s largest cities including Philadelphia (more than 1.5 million residents) and Pittsburgh (more than 305,000). While jobs for artists can be found in many cities across the state, these top two largest cities in the state offer the best (and most) opportunities. Artists in the state, particularly digital artists, work at creative agencies, graphic design firms, web design companies, mobile companies, game design studios, film studios, publishing companies, galleries, museums, printing firms, schools, and more. In addition to bustling cities, job opportunities, and a large number of art venues, Pennsylvania has its fair share of top-tier art & design schools. Just a few popular options include Arcadia University in Glenside, Messiah College in Mechanicsburg, and The University of the Arts in Philadelphia. Several other options are available for aspiring digital artists, so read on. 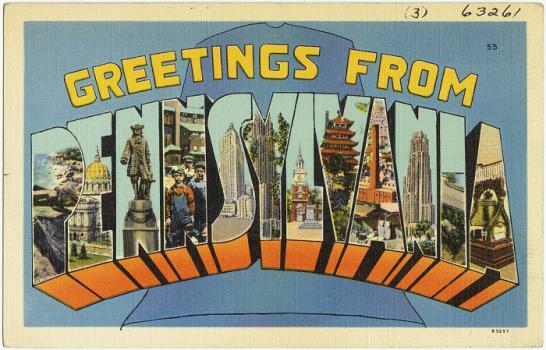 Pennsylvania is home to a staggering 262 Title IV degree-granting colleges and universities. This places Pennsylvania in the number three spot on the list of states with the highest number of colleges and universities. California is in first place with 454 schools, and New York is in second place with 304 schools. Pennsylvania’s Title IV schools are home to nearly 780,000 students, with thousands enrolled in the state’s top art and design programs alone. Scroll through the list below to review Pennsylvania’s top schools for aspiring digital artists and what they have to offer. Pennsylvania is home to more than 60,000 professionals working in Arts, Design, Entertainment, Sports, and Media (ADESM) occupations. They earn an average annual salary of $50,590 up slightly from $45,470 in 2009, when the state was home to 62,340 ADESM professionals. It is important to note that many artists and designers are self-employed, so it is safe to assume that the population of ADESM professionals in the state is much higher. These individuals typically earn more as well—especially in larger states and major cities. In fact, according to the Bureau of Labor Statistics (BLS), the “Independent Artists, Writers, and Performers” ‘industry’ has the highest concentration of employment (not the highest level of employment) in ADESM occupations, and it is one of the highest paying industries for ADESM professionals. Overall, independent artists average $70,620 per year. Independent artists working in animation average $75,150 per year and those working as art directors average $91,100 per year. Independent fine artists average $43,390 per year, and independent craft artists average $36,590 per year. Nationwide, the median annual wage for ADESM occupations was $43,100 in May 2014, which was higher than the median annual wage of $35,540 for all occupations. The top five states with the highest employment levels for ADESM professionals are California, New York, Texas, Florida and Illinois. However, you don't have to relocate to land a position in digital arts. Consider starting your job search in Pennsylvania's major cities—Philadelphia, Pittsburgh, Allentown, and Erie. Also worth exploring are Reading, Scranton, Bethlehem, and Lancaster.